Artist's rendition of "The Past Speaks to Us" mobile app. From THE Journal. The Real Thing. Suggested by a sixth grader in California: “Some students have a hard time with subjects but they don’t want to ask teachers. This app would let them watch videos or talk to real professionals about the subjects they are learning in school.” Some institutions are already offering YouTube videos like this to explain the job of a curator or an expert’s view on a topic. iMu-see-’em. Suggested by an eighth grader in New Jersey: “This app is at once a virtual planner, information database, and textbook archives. It includes a three-dimensional model viewer for referencing subjects, like various works of art.” I see the convergence of these activities happening already; take a look at Central Park or Explorer: The American Museum of Natural History (staff report available). The Past Speaks to Us. 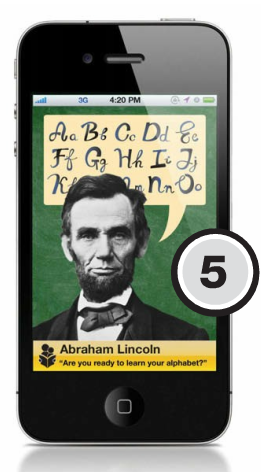 Suggested by a second grader in Arizona: “This game will let you choose famous people who were teachers from the past. Then they will tell you some of the smartest facts they know.” Not quite an app, but the award-winning Architect Studio 3D includes a virtual Frank Lloyd Wright that provides advice on the design of your project. My Teacher Match. Suggested by a twelfth grader in Wisconsin: “This program scrutinizes how each student learns best through a test that measures their interests, hobbies, and special skills. Teachers are quizzed separately on the same criteria and matched up with compatible students.” Okay, this probably would only work for museums with large staffs, but perhaps it could be modified to give museum staff an advance warning of student interests and skills, and they could present the activities that would be most engaging. So far, I haven’t seen anything like this–the closest is a online teacher pre-visit survey from the Kentucky Historical Society. This entry was posted in Technology on November 16, 2011 by Max van Balgooy.